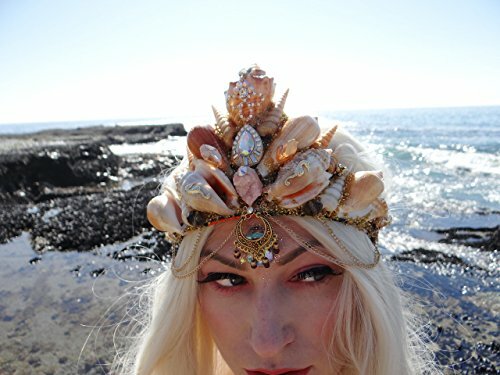 This beautiful Mermaid Crown is completely handmade. Details of this crown include an elastic band to ensure a secure fit, seashells(real), brown glass beads, gold beads, gold chain, gold seahorse charms, opalescent pendants, and a peach crystal. The center of the crown measures 5 inches tall and can fit any hairstyle. The mermaid crown is perfect for your birthday photographs, mermaid costume, or for a decoration! View More In Beauty & Grooming. If you have any questions about this product by Star Stuff Boutique, contact us by completing and submitting the form below. If you are looking for a specif part number, please include it with your message. Sale! 100 Lush Inspired Bath Bomb Fizzy Assorted Wholesale lot; All Natural Ingredients and Home Made with Texas Size Love. Rare Pendant Snuff. Perfume/ Snuff-Bottle. Artistic Handmade Work Sterling Silver 925. Set With A Smiling Gem Ruby. A Useful Spoon Is Attached Inside On A Sterling Silver Charming Chain.